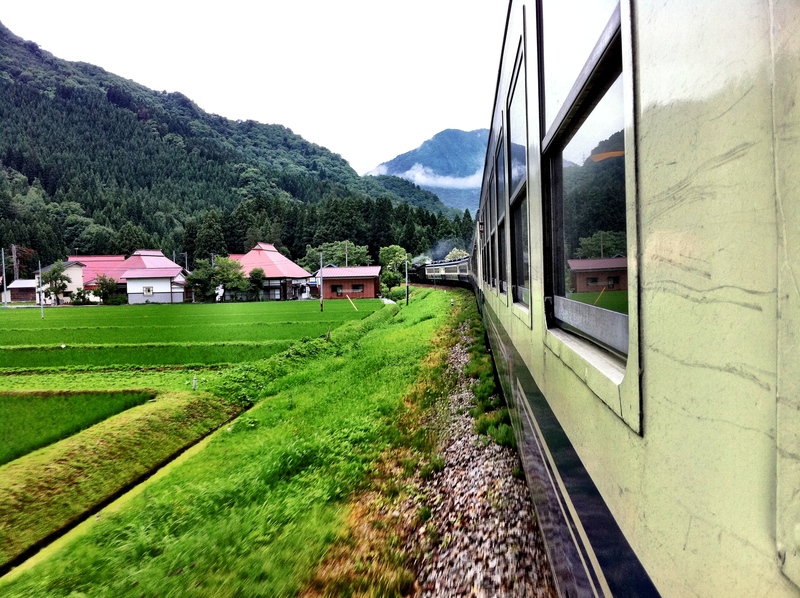 Today’s edition of Densha de Dan takes us along the Banetsu West Line running from Niitsu, Niigata Prefecture to Aizu-Wakamatsu, Fukushima Prefecture. Outside of the winter months, you can ride one of the few Steam Locomotives (SL) that run throughout the country. The SL that runs on this particular line is the Banetsu Monogatari. 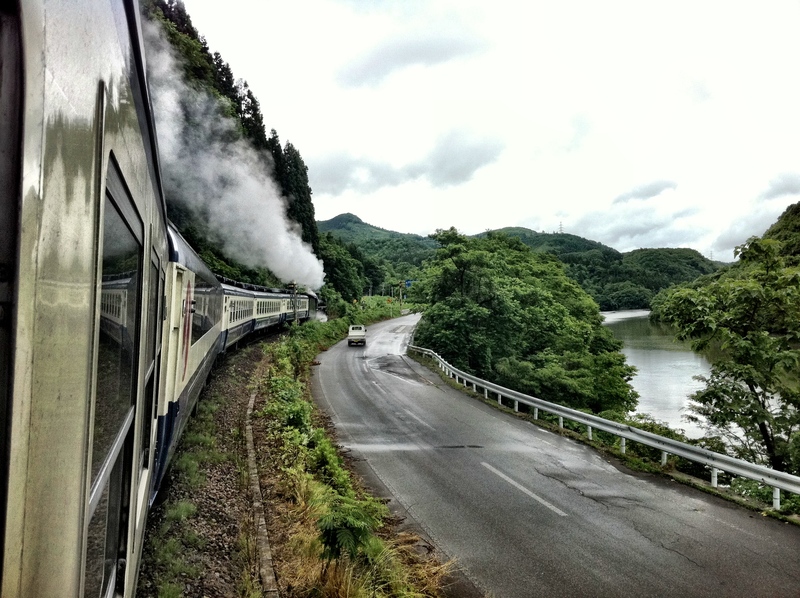 [The] SL Banetsu Monogatari is a special express train that runs on a 126-kilometer track from Niigata to Aizuwakamatsu in Fukushima. On an approximately 3.5-hour ride, it stops at 10 stations on the way to Aizuwakamatsu and at nine stations on the way back. 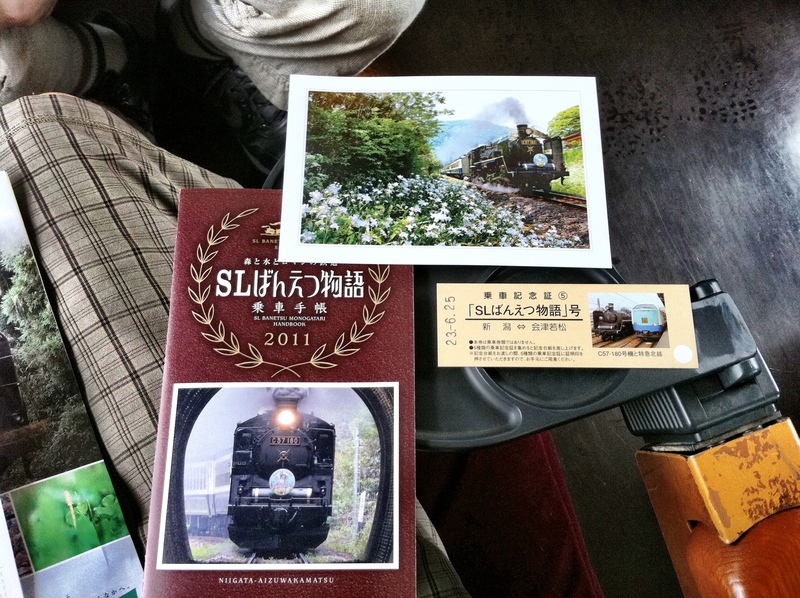 […] This steam locomotive is a C57-108 type train that was in service from 1946 to 1969. By restoring and repairing the train that had been stored at an elementary school in Niitsu City, its routine run on the Banetsu line began in April 1999. 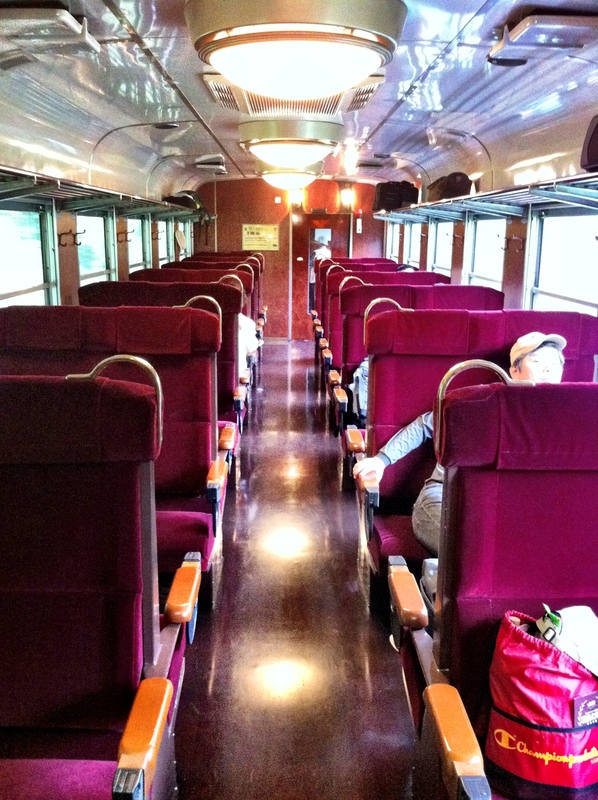 The interior of the train and the uniform of the crew are designed in a style unique to the Taisho era which is also the period when the Banetsu line was opened. running along the agano river. 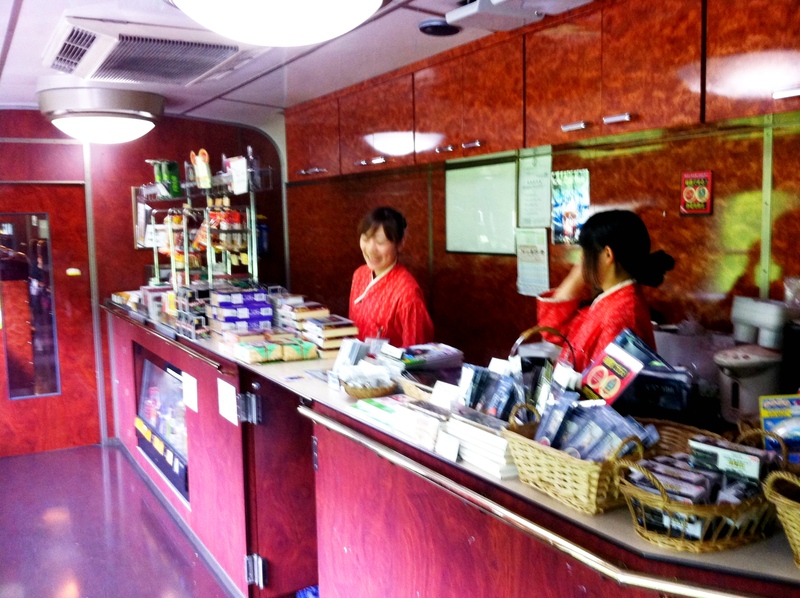 The SL has a total of 7 carriages, with one being an observation carriage and another with a small shop on board, selling bento boxes, snacks, drinks, and special souvenirs that can only be bought on the train. Despite tens of millions of people using the Japan Railway System everyday, riding an SL is a completely different experience all in it’s own. It brings you back to a time before tolled highways and bullet trains, when riding a steam train was once a luxury for most people. Although riding a steam train today isn’t as expensive as it was in the first half of the 1900’s, it still feels like you’re riding something special. 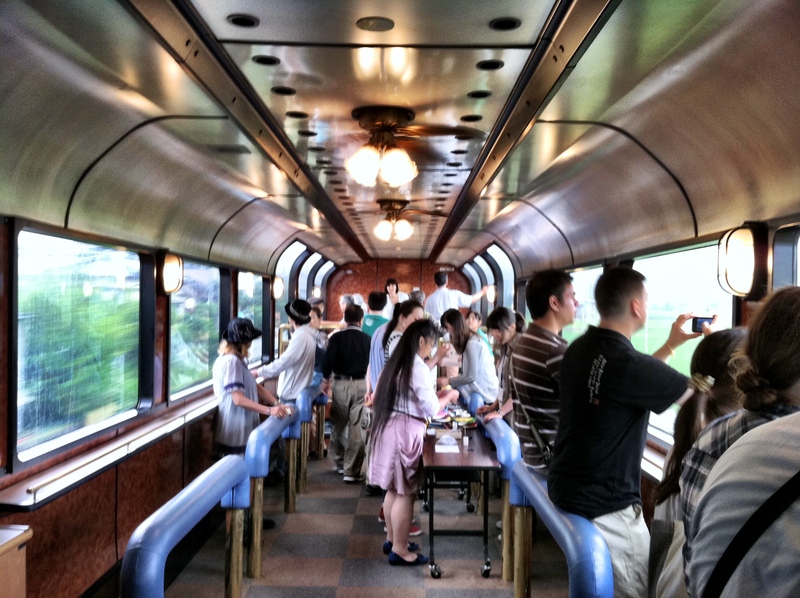 The service on the Banetsu Monogatari is particularly unique as the train conductor and other staff hold events and activities throughout the ride. 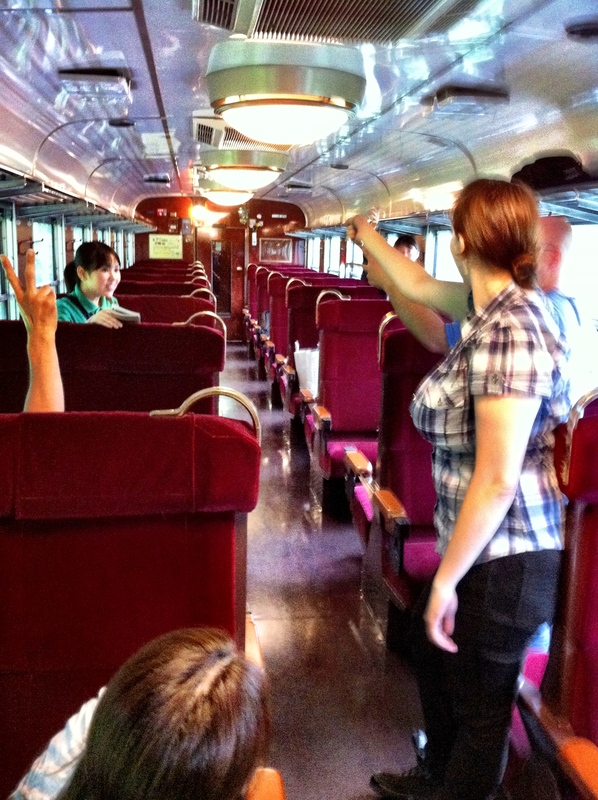 During the journey, the conductor will come through the carriage and engage with the passengers in a game of rock, paper, scissors. Through elimination with the conductor, the last 2 passengers to win wins a commemorative pin with the train’s seasonal logo. In the observation carriage, there are several different arts and crafts projects that children (and adults still children at heart) can participate in. 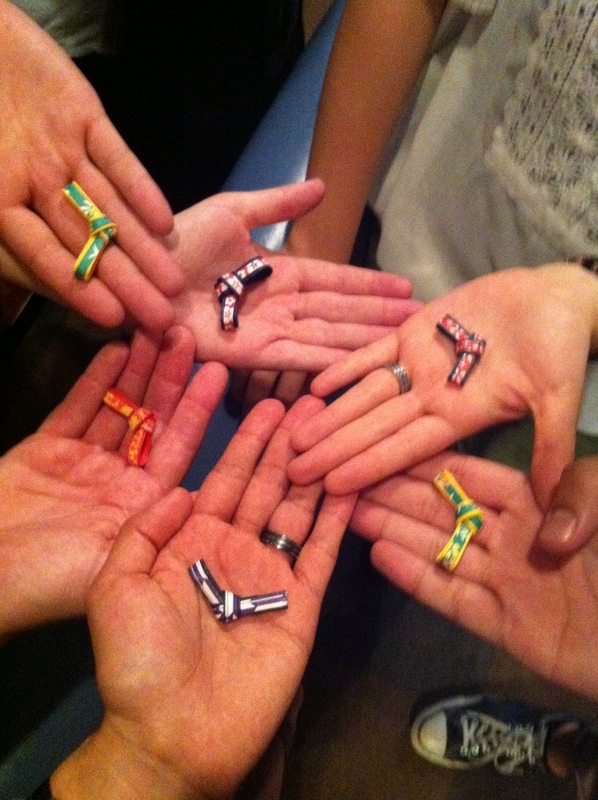 For example, on this day, we made chopstick holders. These small touches make the normality of riding a train non-existant. This is one of my favorite routes for a number of reasons. The Banetsu West Line runs along the Agano River, which allows the train to travel over steel bridges, through narrow forests, and numerous tunnels. Monotony is what you will not find on this route. 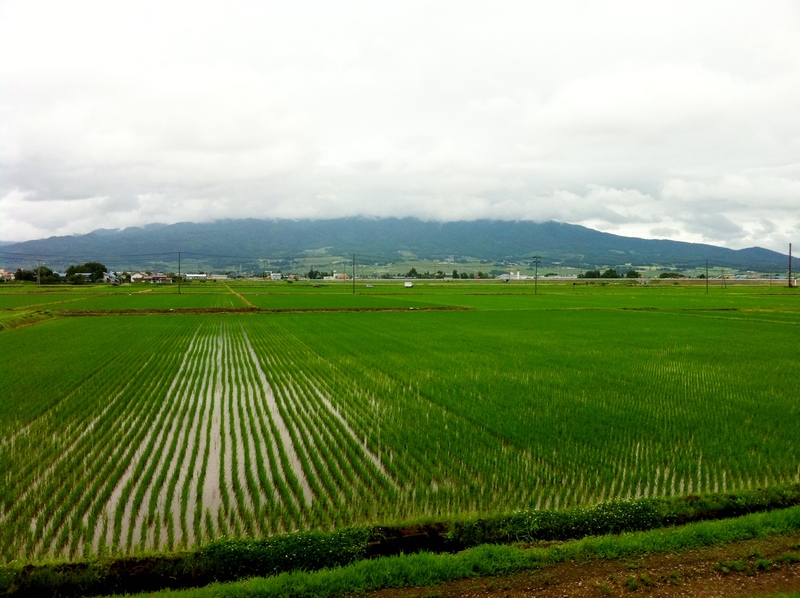 Before arriving into Aizu-Wakamatsu Station, the line separates from the river, allowing passengers a great view of rice patties that scatter the countryside with Mt. Bandai and the surrounding mountain range dominating the horizon. Whether it’s a one-day trip into Aizu-Wakamatsu, or an overnight venture, there is plenty to do before heading back home. There are castles, hot springs, museums, and the area is famous for it’s ramen. 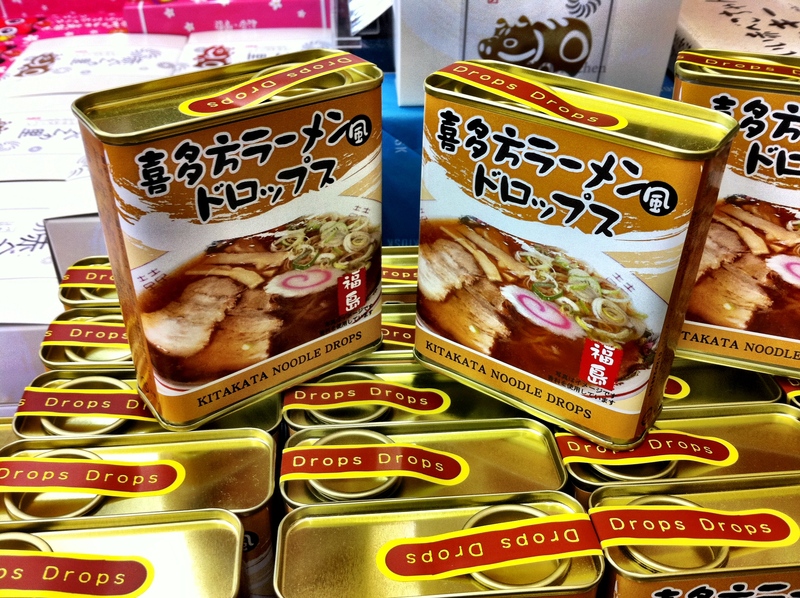 take home the taste of ramen in convenient...candy form? The Banetsu Monogatari runs each weekend (and during national holidays) from April to October, and also a few times during the Christmas season. So, how much do tickets cost to ride the SL Banetsu Monogatari? Surprisingly, not that much. It’s only ¥510 in addition to the normal fare from start to finish. 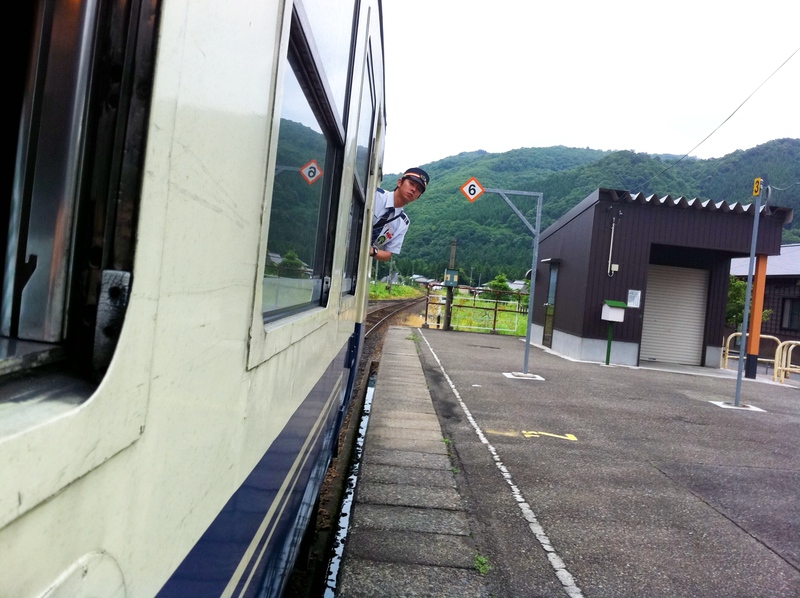 For example, the fare from Niitsu to Aizu-Wakamatsu is ¥1890. If riding the SL, it all comes to ¥2400. and you get free stuff?! ALL seats are reserved, so tickets MUST be bought in advance and are only available at stations that sell tickets (Midori no Madoguchi). They CANNOT be bought from automated ticket machines. Recently, I’ve gotten questions like, is it safe to travel to Fukushima? What about the radiation? Damage? And I usually reply with, what about it? I’m not going to start a debate whether or not there is a radiation risk, but to not visit Fukushima Prefecture because of these worries will leave you missing out a beautiful (and delicious) part of Japan. 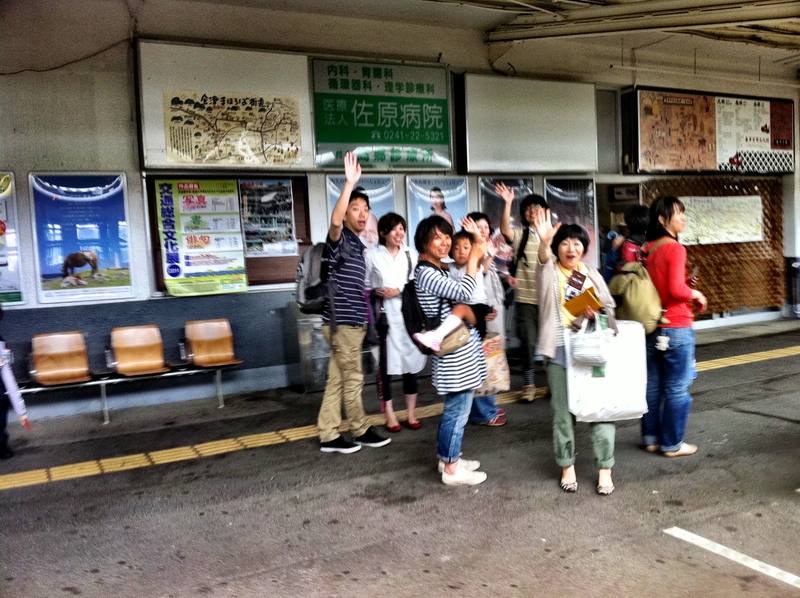 We were only in Fukushima for a short bit, but even in that time, the warmth and hospitality that was provided by the people of Fukushima was the cherry on top. Don’t think about it. Just go!! I’ll leave you with a video that I made during my first trip on the SL almost three years ago. Enjoy! 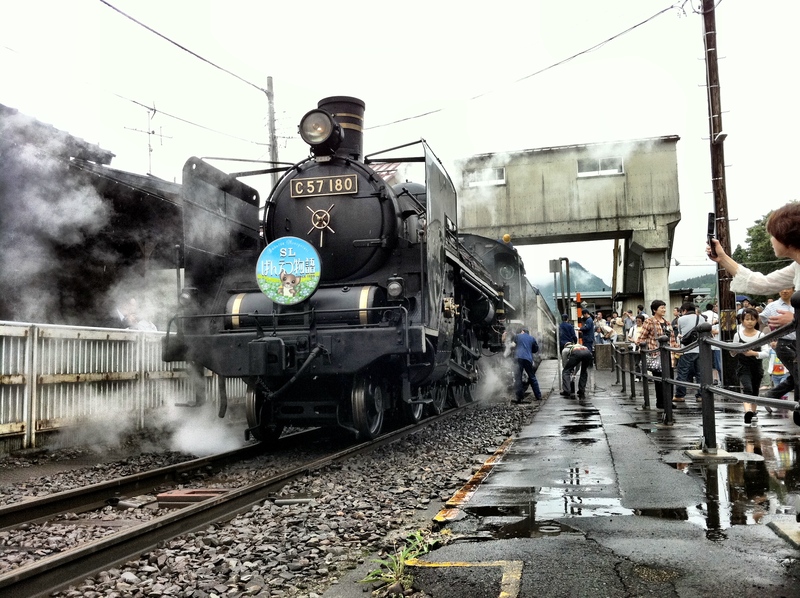 SL Banetsu Monogatari – Official webpage from the JR East website. All information in English! A red-and-black snake about one meter long was found Monday on a Shinkansen train running between Shin-Osaka and Kyoto stations on the Tokaido Shinkansen line, police said. A conductor found the snake on a seat in the No. 3 car of the Kodama No. 642 train at about 9 a.m. Monday. The train originated in Shin-Osaka and was bound for Tokyo. The conductor asked the sole passenger in the car to evacuate to another coach and closed doors to confine the snake. Staff from the prefectural Animal Shelter in Konan, Shiga Prefecture, captured the snake and turned it over to local police. No one was injured. The snake is believed to be a Honduran milk snake, according to the Japan Snake Institute in Ota, Gunma Prefecture. The species is not poisonous and is often imported to Japan as pets. Dogs and cats can travel on Shinkansen trains for an additional charge, but snakes are prohibited. What this article doesn’t address however, is how the snake got there in the first place? And was it intentional? Obviously, who ever brought the snake on board didn’t intend on harming anyone, but still…weird.